The herd of Boskarin cattle, that was transferred to the Tauros Programme breeding site in the Velebit Mountains at the end of March 2014, has a new member. A bull calf was born in the chilly summer night between 30 and 31 July, healthy and gorgeous. The herd of Boskarin cattle in the Velebit Mountains has a new member. It is the 15th member of the herd and the first of its herd to be born free in the wilderness of the Velebit rewilding area! The bull calf, born in his natural habitat, without any need for de-domestication, was quickly standing on his four legs. In time he will reach more than two meters in length and maybe up to a ton in weight. This herd is the first of Boskarin cattle to be brought back to Velebit. 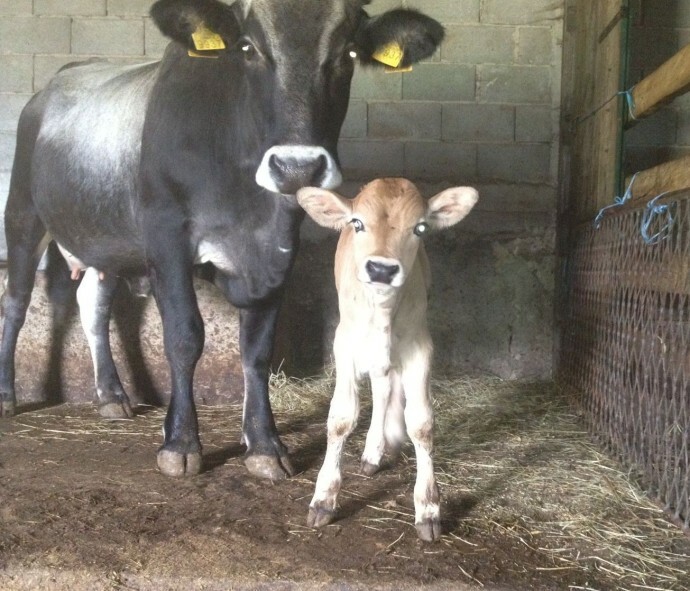 The newborn is one more proof that the plans by Rewilding Velebit and the Tauros Programme’s, to de-domesticate and rewild original cattle breeds, and breed them with other original breeds in order to get closer to the aurochs, are moving into the right direction. It is safe to say that the Boskarin are quickly adapting to the local conditions. This moment was long awaited by Rewilding Velebit team and its human backup for the Boskarin here, Mr. Petar Knezevic. “In the late afternoon the Boskarin cow left the herd and came to us looking a bit unwell and drained, moving very slowly. After a couple of hours we went to check on her and I saw the little bull which was trying to stand up on his shaky back legs. My middle daughter called him “Žučko” (Yellow) by the colour of his coat. The birth of Žučko was a very special and proud moment for all of us!”, says Peter. The joyful news of the birth and the first photo of the baby bull quickly spread to all the Rewilding Europe countries and its team members. During the past few months this herd went through quite a lot, from the efforts of finding their way back to their wild instincts, over to successfully defending themselves against wolves. Future will bring many more challenges for the rewilding efforts here and elsewhere, but the Boskarin are slowly but safely making their comeback. Soon hopefully reinforced with a new bull for this front of the line back breeding programme.